I’ve lost count of the number of Wi-Fi routers I’ve been through over the last ten years, most ranging from just OK to the plain terrible. When I started experiencing problems with WI-FI connectivity a few months ago, I decided once again it was time to replace my router, and after lots of research, I picked the Asus RT-AC66U. I’m not going to discuss this router’s advanced features in depth because you can head over to the tech specs page on Asus’s website. Instead, I’d like to concentrate on ease of use, reliability and critical SoHo features, because most important for me is reliability and consistent performance for basic Internet connectivity. 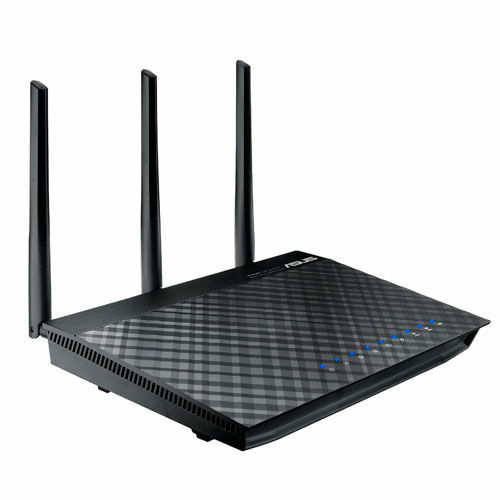 The RT-AC66U is a dual band 5/2.4GHz router but isn’t Asus’s latest model, and as an AC 1750 router, there are AC 1900 and AC 2400 models that theoretically provide faster cumulative speeds. But I believe the RT-AC66U offers the best value for money and will surpass performance expectations for all but the most demanding scenarios. As a SoHo (Small Office/Home Office) device, the RT-AC66U has some features that are worth calling out. There’s no built-in DSL modem, but it supports automatic and static IP, PPPoE (MPPE supported), PPTP, and L2TP ISP connections, including Dual WAN Links. If sharing a printer, mobile Internet, or disk drive is important, it’s worth noting that the RT-AC66U has two USB ports, one USB 2.0 and one USB 3.0, although this shouldn’t be considered a replacement for a proper NAS solution. Also included are four gigabit Ethernet ports. Wi-Fi security includes all common encryption standards: 64-bit WEP, 128-bit WEP, WPA2-PSK, WPA-PSK, WPA-Enterprise, and WPA2-Enterprise. The firewall has Stateful Packet Inspection (SPI) intrusion detection and DoS protection. And should you need them, parental controls, network service, URL, and port filters. 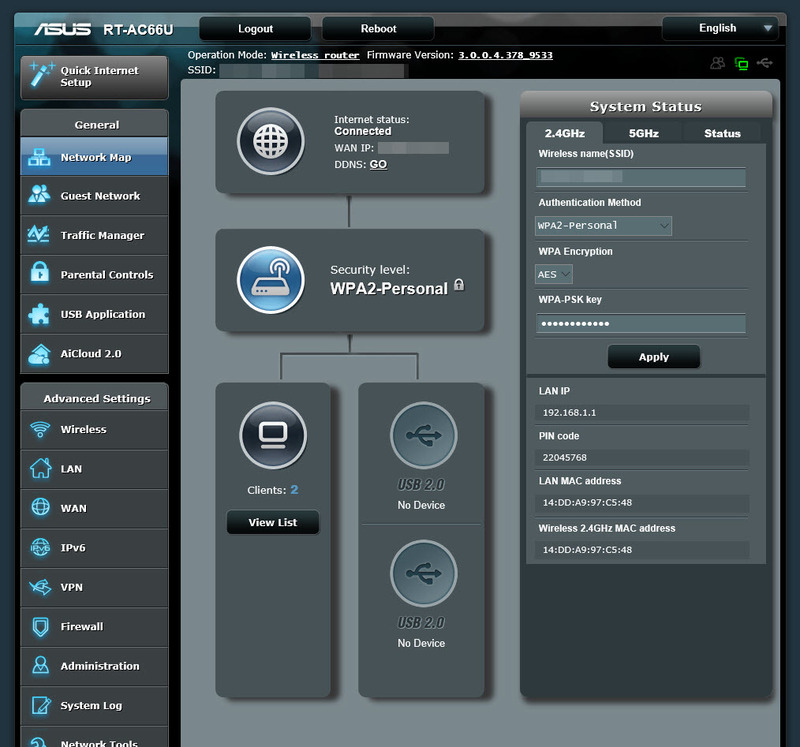 There’s also the ability to create a guest network so that you can keep casual users segregated from sensitive devices. The VPN server supports IPsec, PPTP, and L2TP pass-through; and includes a PPTP and OpenVPN server. There are three VPN clients: PPTP, L2TP, and OpenVPN. The RT-AC66U has automatic QoS configuration with Airtime Fairness, and QoS can be configured manually if required. 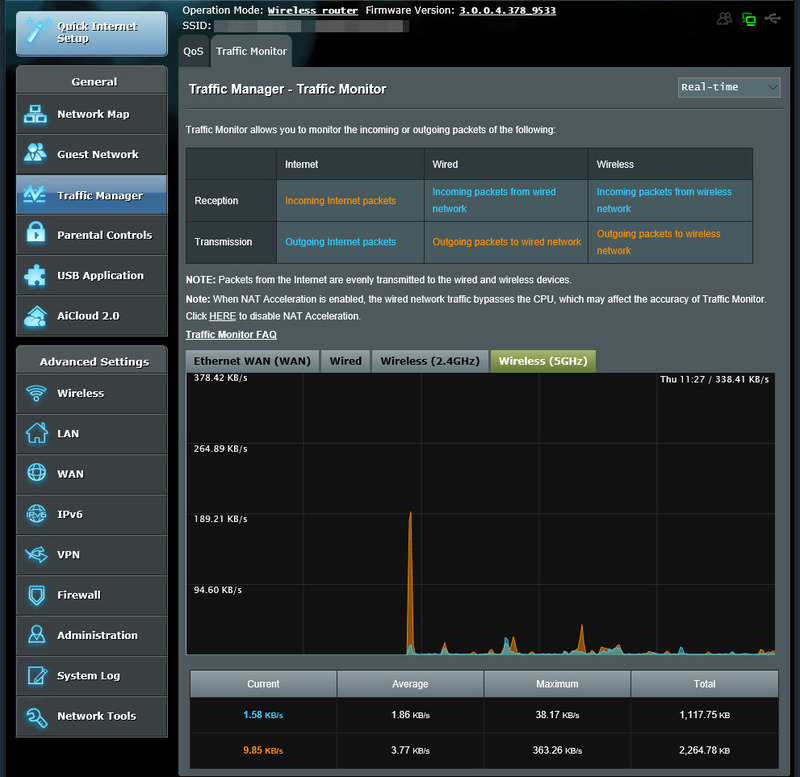 Although I prefer not to enable QoS on routers unless I experience specific network performance issues. Finally, the router has several different modes of operation. It can serve as a Wi-Fi router, access point — i.e. connect to a wireless router using an Ethernet cable to extend the Wi-Fi signal to other network clients — as a wireless range extender, or media bridge if you want to purchase two RT-AC66Us. This is probably the easiest router I’ve ever set up. I connected the router to my notebook with the supplied Ethernet cable, followed the three-step wizard, which included updating to the latest firmware, and I was up and running. I had a quick poke around the menus to see if there were any default settings that weren’t to my liking, but decided to leave everything in place, and the router hasn’t given me a problem since. The RT-AC66U sits on a windowsill in my home office, hardly an ideal placement, and through two brick walls and about 35 meters, it works flawlessly in the kitchen. How about that for scientific testing. Sure, there might be a slight drop in speed, but nothing that prevents streaming high quality YouTube videos or music. I’ve rebooted the router twice in three months. The RT-AC66U is the most reliable router I’ve ever owned. It does run hot, but not hot enough for me to worry overheating is an issue that might shorten its life. There’s usually three or four devices connected at any one time, and again the RT-AC66U deals with this in its stride. It’s worth mentioning the Web UI, which is very well designed, with easy navigation, while at the same time providing access to advanced features and monitoring tools, such as the system log and traffic manager. This router is so much better than the standard fare most people use in their homes or small offices, that I’ve taken to carrying it with me whenever I’m away from home for more than a few days. I usually prefer to stay in apartments rather than hotel rooms, where the Internet is slow not because the ISP provides a bad service, but because of the router’s poor Wi-Fi signal. So all I need to do is connect the RT-AC66U’s WAN to an Ethernet port on the existing network and any Internet connection issues are solved. While at $199.99 the RT-AC66U can’t be considered an entry-level model, I’d recommend paying the extra for the excellent reliability and performance of this device.